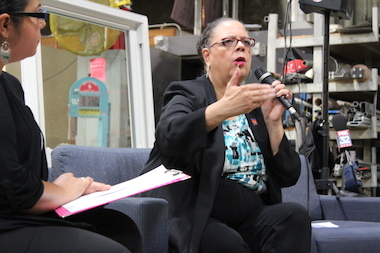 Karen Lewis stopped short of making any big announcements at a Southwest Side stop on her "Conversations with Karen" tour. On Monday it was announced Lewis, the president of the Chicago Teachers Union, has decided not to run for mayor of Chicago against Rahm Emanuel, her campaign office said. THE LOOP — Karen Lewis, the president of the Chicago Teachers Union, has decided not to run for mayor of Chicago against Rahm Emanuel, her campaign announced Monday afternoon. Lewis fell ill and was hospitalized last week with a yet-to-be-disclosed illness. She had been contemplating a challenge to Mayor Rahm Emanuel, with whom she has sparred for his entire first term, including the 2012 teachers' strike. Yet her sudden ailment — referred to only as a "serious illness" requiring surgery by her top union staffer — immediately cast doubt on her entering the race. The election is in February. Michael Sneed of the Sun-Times reported that Lewis is suffering from a cancerous brain tumor that was diagnosed last week. 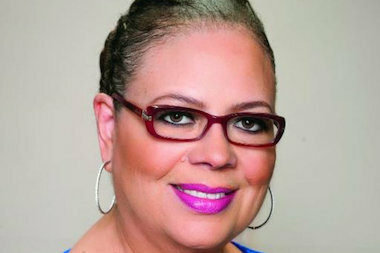 Karen Lewis' campaign on Monday announced she would not run for mayor. Her campaign did not address her illness Monday, but simply said that Lewis "has decided to not pursue a mayoral bid." Emanuel issued a statement in response Monday saying: "Karen Lewis is a passionate advocate for her beliefs and has always been willing to speak up for her view of what's best — not only for the teachers that she represents, but also for issues critical to the future of our city. Along with all Chicagoans, we will keep Karen and her family in our thoughts and prayers, and we hope to see her on her feet very soon." “On behalf of Karen Lewis and her exploratory committee, I want to first and foremost thank the teachers, sanitation workers, social workers, librarians, parents, police officers, firefighters, youth, artists, school clerks, grandparents, bus drivers, workers, and retirees who collected tens of thousands of signatures for Karen Lewis. Your support rang out from every corner of this city, demanding new leadership at the highest level of city government. “Karen Lewis has decided to not pursue a mayoral bid. Yet she charges us to continue fighting for strong neighborhood schools, safe communities, and good jobs for everyone. “The tens of thousands of signatures collected for Karen confirm what the polls have already said: Chicagoans from Beverly to Uptown want to feel safe in their neighborhoods; they want an elected representative school board; and they want political leadership at every level that is responsive and responsible. “Our work is not about one leader, one race, or one election. Our work is about building progressive power to restore participatory democracy to Chicago. The groundswell of grassroots support is a testament to the strength of our movement and to the depth of dissatisfaction that hardworking Chicagoans have with the top-down, out-of-touch leadership in City Hall. In a statement Monday, mayoral candidate Ald. Bob Fioretti (2nd) said: "For Chicago’s sake, I hope this is not the last we see of Karen Lewis. I have the pleasure of calling her a friend, and I join many across this city in praying for her health today. "I can understand the battle with illness, and how it can change the best thought out plans. But I also know that Karen is resilient and strong and will be back advocating for educators, students and Chicagoans in no time. "Karen and I find common ground on many issues and her participation would have elevated the mayoral debate. It’s up to us to continue the movement and to keep fighting for safe streets and great neighborhoods."